Thank you Barbara. What a thoughtful reflection. There are no words to describe how horrible an act this was. I feel for the families. My heart aches for them. I have been hugging my children non stop. 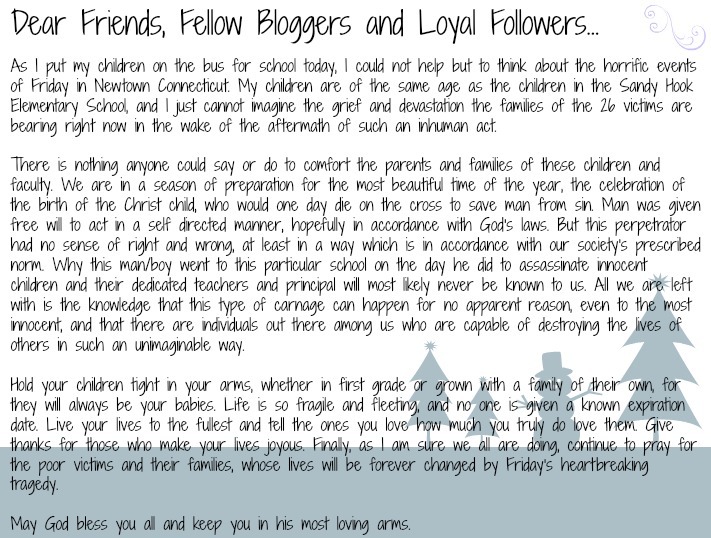 Thank you for sharing your beautifully written tribute, Barbara. I've had a difficult time embracing the spirit of Christmas ever since I learned of the unbelievable tragedy. But, I know that out of the sorrow and devastation, there are miracles and heros and new beginnings. And, there are millions of parents like us who've received a powerful reminder to treasure our families, cherish our children, and value every single moment we spend with the ones we love. May God Bless each and every one of us. Thank you for your words. I have to believe that God is in control and has welcomed those innocent children and their caretakers home with open arms. God bless you and your family this Christmas season.